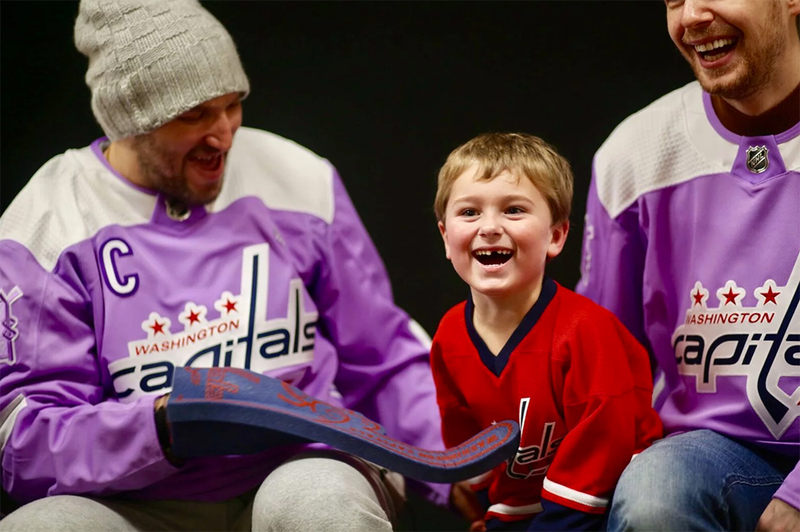 The Washington Capitals made their annual visit to MedStar Georgetown University Hospital on Monday as part of the NHL’s “The Biggest Assist Happens Off the Ice” program. Team members joined patients and their families in the hospital’s Tracy’s Kids art clinic to squirt paint at a canvas, doodle around a small table, and autograph gifts including blankets, posters, and Capitals Kids Club kits, which are provided by Capitals fans through the team’s Kids Club kit donation program. The Caps sported purple jerseys, part of the Hockey Fights Cancer campaign, which seeks to unite the hockey community in its efforts to raise money and awareness toward a cure.